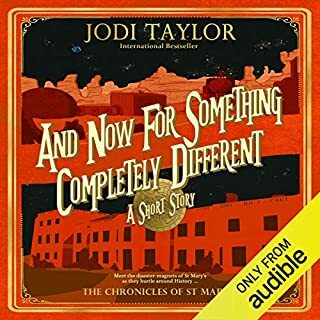 The first in a series of outlandishly clever adventures featuring the resourceful, fearless literary detective Thursday Next - a New York Times best seller! Fforde's ingenious fantasy - enhanced by a website that re-creates the world of the novel - unites intrigue with English literature in a delightfully witty mix. 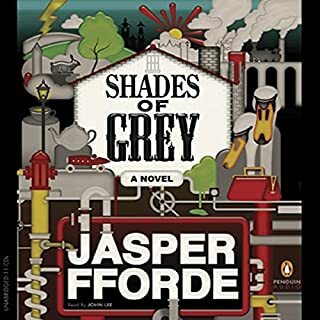 Delve into Jasper Fforde's literary universe with the other books in his Thursday Next fantasy/detective series. Combination of literary steepage and science fiction. Wish I was more steeped in literature to get more of the jokes/connections. Reading Wikipedia entries added much to my enjoyment. As a bicycle mechanic, I did get the references to Sturmey Archer and Bowden Cable. Which made me realize I likely missed dozens of others. 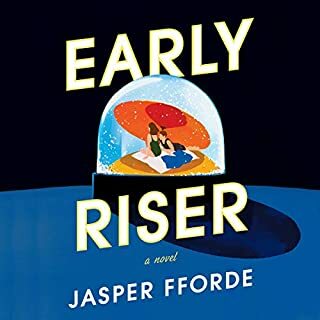 Close friends had long recommended Jasper Fforde and I finally decided to take the plunge. The story is very good, not great, but very entertaining. There were are few stylistic bits, e.g., beginning each chapter with quotes from fictional gov't transcripts or characters' biographies or journals; also the tension over Thursday's brother could have been omitted. I also wanted to know more about the villain and the text offers very little. If I could go back would I drop a credit on this book? ABSOLUTELY. It was fun and entertaining, that's what I was looking for and that's what I got. The narrator is excellent, very good with accents. I immediately downloaded book 2 of the Thursday Next series, clearly I'm hooked. A lark for bibliophiles everywhere. Do you love classic literature? Do you enjoy whimsy and word plays? A smile that turns into a laugh? If so, this lighthearted frolic into literary never, never land will delight you. I'm not a mystery fan but was drawn to this book by the allusion to "Jane Eyre" and I'm so glad I listened to it. Give yourself a vacation and enjoy this literary romp. Charming in its way but can't decide who it wants to be. I liked the idea of this story. The way the author played with the idea of an alternate reality was fun. Where I struggled with this book is in trying show his cleverness, he threw every possible idea, pun, word play, plot point, etc. that he could think of into one story. To me this book has a bit of an identity crisis. Trying to cater to lovers of great novels and time travel is hard enough but to do it in a way that is quasi-futuristic or super alternative world based is impossible. Throw in some war, some government conspiracy, some unrequited love, complicated family relationships, detective work and a few other things and the story is so scattered you just may not care what happens at the end. I really wanted to, but I just didn't. I think you need to be in the right silly mood for this quirky, somewhat twisted tale. I enjoyed it as far as all the goofiness, and the premise behind the book, but it was a little weak and a bit too round about as far as the plot is concerned. Not sure if tried and true Jane Eyre fans will appreciate this one, but if they have a bit of a love for tongue in cheek, then maybe they will. Definitely not the most heavy going of literature. But clever and funny, particularly for those with a wide love of good books. 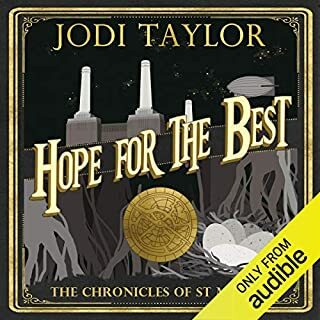 I listen to audio books when running, and this one really helped me crank the miles out - I couldn't wait to get out for my next installment. 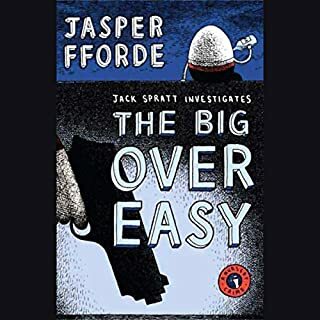 Jasper Fforde is my hero. He is so creative. HIs love of language and words is visible in his descriptions . Thursday Next is a great haracter surrounded by other great characters. The naration is great and Ms Duerdan is, for me , the voice of Thursday Next. I love this series . 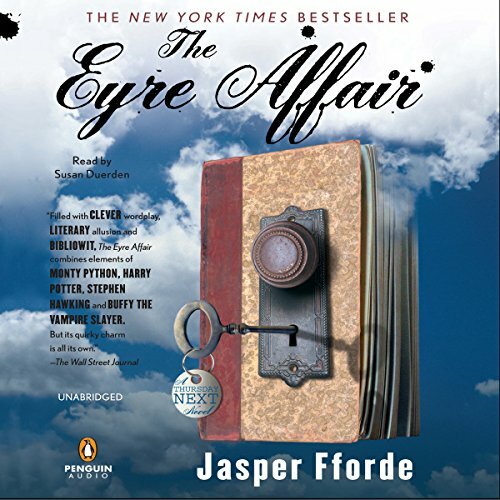 If you could sum up The Eyre Affair in three words, what would they be? If you like audio books and reading, this book will have your reading more and more. Bronte, Austin, and many more classics. The way FForde removes classic charactors and uses them in different contexts will make you go back to the originals to see if you could pick up these personality traits. Then the clever use of alternate histories of real events, again the listener will have to review the actual history (as we know it) to get the parody and paralels. oh yeah, once you've gone through the first book over and over until you pick up all the plot shifts, you WILL be moving on to the next book and so on ... listener beware! The amount of crossed genres at first is confusing. then, once you just go with the concept of all things crossing over and through books, you will begin to wonder how far the ideas can go. What about Susan Duerdan’s performance did you like? well portrayed with the sarcasm and snarkiness that a real person migh experience put in situation after situation. Jane and Heathcliff tonight, Live on 20/20. 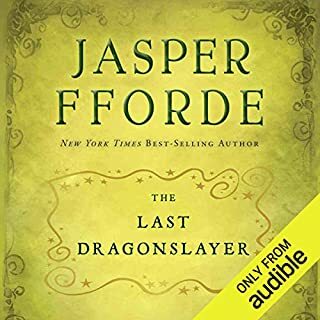 A friend told me the basis of the plot line (jumping in and out of the books of classic litrature) and Jasper does not disappoint. This reminds me a bit of an Artemis Fowl book only with curse words. There is some clever word play and humorous moments, however, the story did not hold my attention very well. The constant time travel back and forth made it seem like a never ending journey to the inevitable non-ending cliffhanger.